Summer is the time to kick up your feet and kick back with a good book. 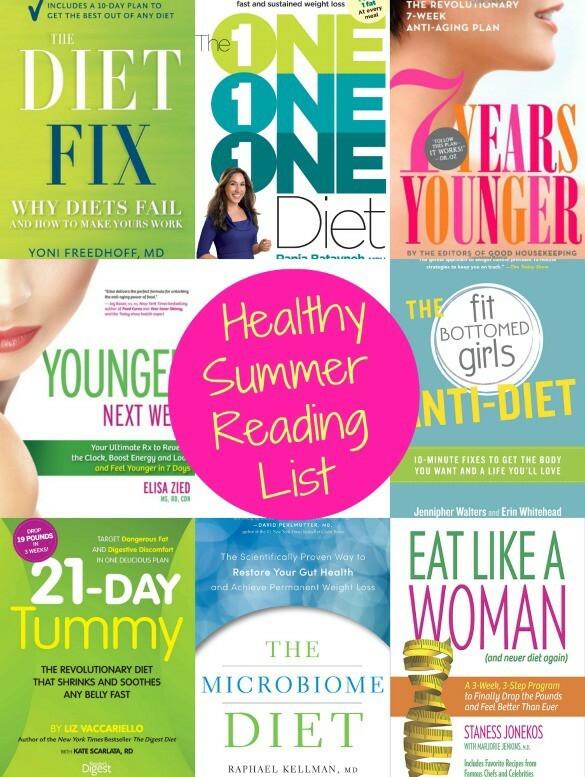 While guilty-pleasure fiction is always fab on the beach or at the pool, we think these healthy books are worth adding to your summer reading list, too! 2. 7 Years Younger. Looking for the eternal fountain of youth? Add this book to your summer reading list. While it may not keep you looking like you’re in your 20s forever, it does have good tips on how to “de-age” your skin and body — and even your brain. With special regimens for skincare, makeup, hair care, nutrition and diet, fitness, brain fitness, and emotional health, it’s got lots of tricks and tools to try! 4. One One One Diet. We’re into balanced eating and all good things in moderation, and this book certainly embraces that! Following the easy guideline of eating meals and snacks with protein, carb and fat (one, one, one of each to be exact, hence the book’s name! ), the book also features 75 recipes from Butternut Squash Chickpea Curry, and Zucchini Chip Muffins. Simple and tasty — how we like it! 5. Younger Next Week. Youth and beauty isn’t just about how you look — it’s about how you feel. And this book gets that. With tips and plans to fuel yourself with nutrient-dense foods, relax and decompress, improve your sleep and boost your energy naturally, author Elisa Zied gives you the tweaks you can start making to feel younger and more vibrant inside and out! 6. The Fit Bottomed Girls Anti-Diet. Haven’t picked up your copy of our book yet? The book we poured our Fit Bottomed heart and soul into with our best plan to help you to be healthier, happier and more Fit Bottomed? Pick it up now! Everyone loves it. Here’s proof. 7. Eat Like a Woman. Caption Obvious alert: Women are not men. And they don’t lose weight like men do (for proof, watch any episode of The Biggest Loser). Designed with a woman’s metabolism in mind, this book will help you to improve your relationship with food, to understand the relationship between stress and your health, and to interpret the messages your body is sending you so that you can support your hormone balance and emotional health. 8. The Microbiome Diet. We’ve been hearing more and more about probiotics and gut health, and this book is a deep-dive into the latest research on it. This book shows you how optimal gut health (managing your “microbiome”) can help you to stay at a healthy weight, have energy, look younger and feel great. Filled with delicious recipes and tips on how to make your gut happy, it’s a fascinating read and a great add to your summer reading list! I love the 21-Day Tummy and glad you included it on your list. Since I’ve been using the book (and I also bought the companion cookbook), my stomach issues have gone away. I have no more digestive issues and I have a skinnier waist. I just feel healthy. Highly recommend!